We now have a class IV Therapy laser that helps decrease pain and inflammation in older pets, helps acute injuries heal faster and can even help with skin infections, bladder infections and other conditions. Plus, the pets LOVE the treatment….it’s very relaxing. 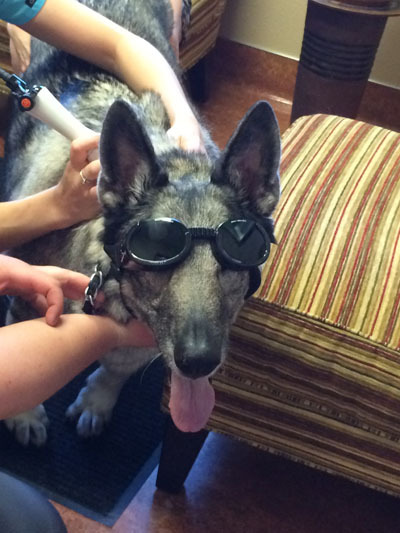 Laser therapy is relatively new in veterinary medicine. The laser light penetrates several centimeters into the tissues and induces a response in the cells called photobiomodulation. It improves the rate of healing and the quality of healing by improving normal cell function. Laser light increases blood flow in tissues and increases the release of oxygen from hemoglobin into cells. This increases a cells metabolism to speed healing and return to normal function. We have had great success with laser therapy. One dog that had been bitten by a coyote and had a lot of swelling and bruising on her neck. The day after laser therapy much of the swelling had resolved and the bruising had decreased dramatically. We have used the laser on several cases of chronic arthritis and joint pain. Both cats, dogs, and rabbits have responded by being more active and seemed to be more comfortable after their laser treatment. Laser treatment only takes a few minutes per sit and the pets seem to enjoy the procedure.